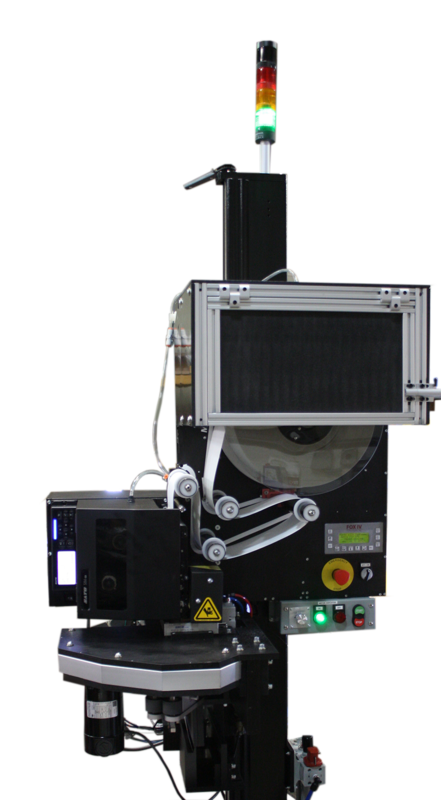 FOX IV Technologies’ SCOOP 6 Tag Print and Place System automatically prints, cuts, and transfers tags to industrial bag sewing systems or other tag handling devices. Each tag can have unique product information, sequential numbers, linear and 2D bar codes. Printing can be direct thermal or thermal transfer at speeds up to 14 inches per second. A heavy duty, precision guillotine cutter cuts the tags to length while speed adjustable guide rollers automatically feed the tags directly into the industrial sewing system or other handling device at speeds up to 30/minute. The guillotine cutter has a hardened steel blade and linear bearings for long lasting performance and precision cuts. Also, the SCOOP 6 features a pressurized housing that keeps airborne contaminants, such as dust, out of the equipment . The SCOOP 6’s versatile, modular print engine can print a maximum tag width of 6” with lengths from 7″- 12”. Print resolutions of 203 dpi and 305 dpi are available. Maximum print speed for the 203 dpi is 14 ips, for 305 dpi it is 12 ips. Because the print engine is modular, it can be easily swapped to maintain system uptime. Additionally, the SCOOP 6 is easy to adapt to varying production lines. The variable speed motor control of the guide rollers allows for fine tuning the tag transfer speeds – up to 80 fpm – to match to feed bag sewing systems input speeds and the rugged industrial stand permits easy height adjustments as well as the ability to adjust the tag transfer angle to the bag feeder. FOX IV Technologies, Inc., has been an innovator in the automated labeling and coding industry for over 30 years. They offer a full line of label printers and applicators, ribbons, labels, enclosures, printing supplies and services, material handling equipment and software solutions in order to provide fully integrated turnkey automated identification systems. The company integrates more than 25 tabletop printers and OEM print modules into rugged label printer applicators capable of operating 24/7 in a wide variety manufacturing environments. Known internationally for innovative designs, quality construction and customized solutions, FOX IV is located approximately 20 miles east of Pittsburgh, PA.